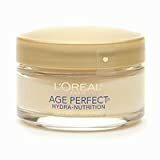 L’Oreal Age Perfect Intense Nutrition Day/Night Cream – 1.7 oz. Why is Age Perfect Hydra-Nutrition right for me? As women mature, skin is gradually depleted of essential nutrients and calcium, resulting in a higher level of discomfort associated with dryness. Skin becomes parched and loses its resilience. The innovation: Introducing a unique nutrient complex enriched with calcium to provide daily nourishing moisture to mature, nutrient-depleted skin-leaving it supple, fortified and resilient.